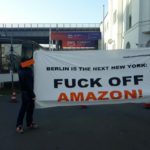 Brochure - Make Amazon Pay! In the context of our campaign we wrote a brochure (sorry so far only in german). The brochure can be downloaded as a pdf file or can be ordered via the form bellow. We’ll try to full fill the demand.